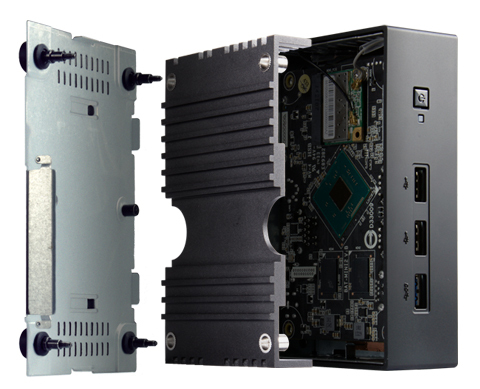 Featuring Intel® Bay Trail-M / Bay Trail-I SoC processors, LIVA X is provided with 64-bit dual-core performance up to 2.25GHz on Intel's advanced 22nm architecture. Low-power consumption LIVA X with fan-less design stays cool while eliminating inflow of debris which might harm the system. When you eliminate the fan, you eliminate the noise. Fanless LIVA X delivers 0dB silence to extend lifespan and provide better acoustic performance. 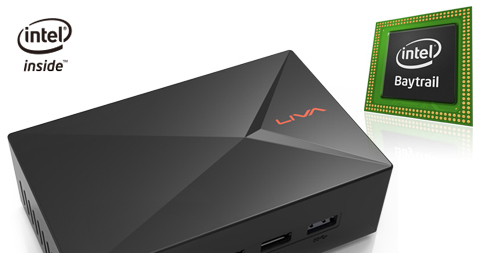 LIVA X consumes only approximately 1/10 the energy traditional of PCs and brings the most efficient performance. Think about the money you can save! 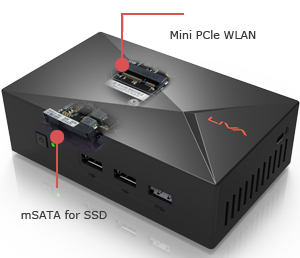 LIVA X supports the latest Windows 8.1 and the most popular Windows 7 (Via mSATA SSD). Linux and Ubuntu OS support is subject to revision. 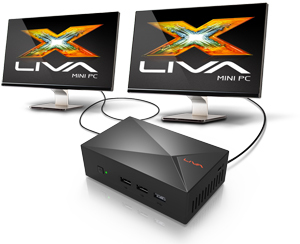 With HDMI and D-Sub support, LIVA X provides two independent output displays for home entertainment and multi-display applications. 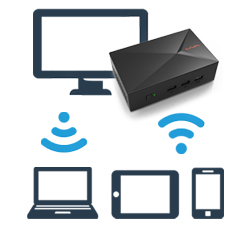 LIVA X supports Microsoft Remote Desktop app to access data anywhere and lots of popular WiFi streaming options for wireless delivery of video and audio. 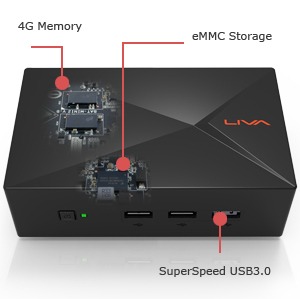 To be the X-factor of the future, LIVA X adopts 4G DDR3L DRAM, SuperSpeed USB 3.0, and ultra-thin eMMC which keeps LIVA X palm-size. Feel the power of expansion! 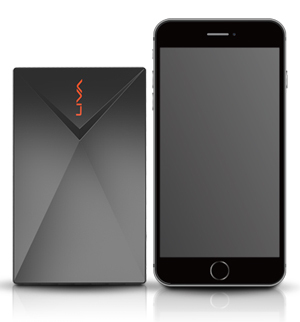 LIVA X offers a Wireless Combo Card and supports mSATA SSDs for more storage with faster data transmission. LIVA X with VESA Mount is way too versatile! 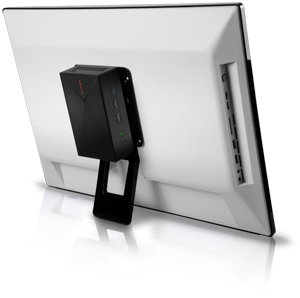 Turn your TV into a PC with a bigger screen, and turn your monitors into digital signage with processing ability. EMI protects against all kinds of accidents to ensure the stability of the system and the health of your users. Redefines the size of a PC! Big PCs gradually do things small. The small-size LIVA X helps do things big! 1.57" x 3.27" x 5.31"
Think about the money you can save! Redefines the size of PC! This item is covered by Runwan Inc Return Policy. Pros: I put Ubuntu 16.04 server on the box using a thumbdrive. Once I made sure I got the UEFI boot options to match, it installed and ran great. Cons: When I installed Ubuntu, I had to boot UEFI so that UEFI grub would be installed. Pros: Linux Mint 17.3 installed easily. Plays YouTube and local HD content readily. It's TINY :). VGA port makes it more connectible to older monitors. USB 2.0 are occupied by keyboard and mouse, but Bluetooth peripherals would solve that slight shortage of ports. Cons: UPDATE 2: I decided to invest in an mSATA SSD (Samsung EVO 850 120GB) to have more room on the system for the OS. Installed drive fine, but had to dig for a hold-down screw for the SSD. Big problem started trying to boot from the SSD. BIOS has SSD as first boot option; Linux Mint 17.3 (as before) is installed on the SSD. However, the system just refuses to boot from the SSD, even though the boot menu shows the Samsung as a boot option. Called ECS support and found that although it was the middle of their business day, no one was available to come to the phone. Not impressive customer service, that's for certain. So I am stuck with an unbootable PC unless I revert to the eMMC for my OS--thereby defeating my main purpose in buying the mSATA. I was thinking about buying another of these, but I might spend more and go with Zotac or another brand that's been building tiny PCs for a while. UPDATE: Finally got it to boot from the SSD, but BIOS was apparently not telling the system to use it until I had saved that setting about eight times. Then it finally booted off the SSD instead of telling me no boot device found (eMMC is empty). Blank screen. Nothing. It simply died on me. Pros: I purchased a Crucial SSD (240GB) to add to this device. I have successfully installed Server 2016 and have been using it as a domain controller for a couple of weeks with no issues. Fast and quite and easy to setup and configure if you have basic tech skills. Cons: More like wishes, would like to be able to add more memory, would be my only sore spot. And 32GB is small but this is about the same setup as my DELL tablet and i have windows 10 installed and it works fine for browsing and media playback. Pros: Small, basic functionality in place if no expansions are added. With no expansion, the system works OK. It is pretty slow but fine for simple tasks. I just wish that it would have a larger temperature range. I am using it as a temporary storage and relay in my barn for surveillance cameras. It is also monitoring my environmental chamber. I need to keep it heated in the winter time. Other Thoughts: Since I had submitted the rebate, I don't want to return it for the refund. Pros: Unit arrived on time, but didn't contain an EEMC card which I did pay for. Try the unit out before your 30day return is up, double check the specs on delivery! Cons: Paid extra for the 32GB EEMC. The box has the 32GB EEMC label, but when disassembled the unit I found that the EEMC is not there. Other Thoughts: I have two kids and recently changed jobs. 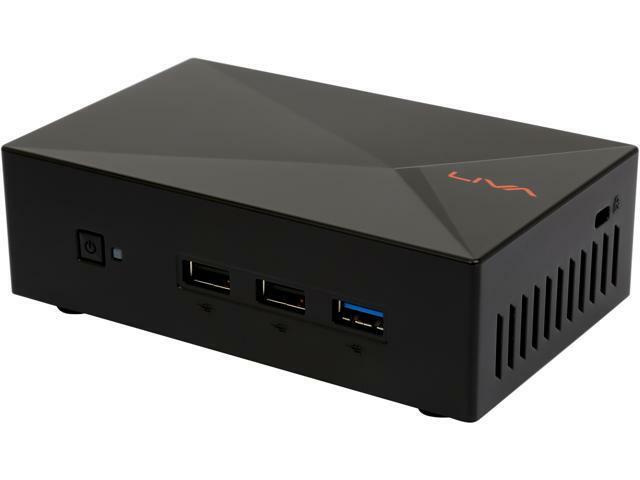 I bought this box to setup as a edubuntu workstation for my kids. When my initial attempts to install the OS failed I shelved the unit until for a month and a half. When a big project at work concluded I took another look. The BIOS couldn't see the EEMC card. I just disassembled it. Guess what, there is no EEMC! We are sorry to here about your issues. Di you by chance to try an OS installation? The eMMC is integrated into the system board. It does not look like a standard SSD or mSSD. It will just look like a chip soldered onto the system board. Also testing from factory would show that the eMMC was missing should it have not been soldered on. If you continue to have issues or have any questions, please feel free to contact us. I or any of my team members here at technical support will be able to help you. Our hours are Mon-Fri 9am-6pm PST. Pros: 1) Dive is Small and very manageable to physically work with. 2) Comes apart very easy to install mSATA card. 3) Works great with external VGA and HDMI monitor/tv. Plugged into my TV and was so cool. 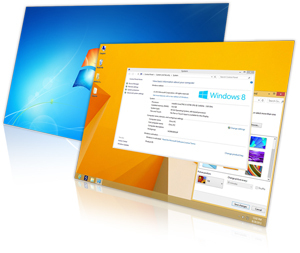 4) Was able to install Windows 7, 8, 10, Ubuntu 15, Untanlge 12.0 and PFSENCE for testing different OS/firewall/IDS products. 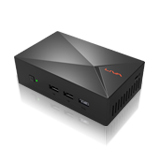 5) Used EMMC as swap drive for Ubuntu. Cons: 1) Did not come with mSATA screws, but the smaller internal Dell/HP laptop screws did work. 2) Issues with using EMMC memory on anything other with Win8.1 (small install), and Ubuntu 15.0. Had to do with drivers for the onboard device from what I researched. This is why I installed a mSATA card. 3) Unable to use EMMC as bootable device unless you have maybe Samsung, MS surface or same type of IOS. Other Thoughts: Built mine with a 120gb Kingston mSATA card and have a multi-boot running with Unbuntu 15 and Untangle 12 right now acting as a Firewall/IDS/DHCO/DNS device. Had a co-working doing the same with pfsense, only issue with that was finding compatible usb chipset Nic that worked with pfsense.